Between work, shuttling the kids to and from school and activities, meeting up with friends, and walking the dog, finding healthy dinner ideas that are easy to whip up on the weeknights isn’t always your top priority. Yet fast food is notoriously unhealthy, and even getting takeout from your favorite restaurant can be filled with nutrition pitfalls. Not to mention the fact that eating “out,” even if it’s on the go, can really take a toll on your pocketbook. Choosing healthy dinner ideas is one of the best ways you can nourish your body — and your soul. With a little planning, some pantry staples, and maybe a bit of weekend prep work, you can come up with inexpensive, easy to prepare healthy dinner ideas to last you all week long. What are you waiting for? Grab your shopping list and let’s plan some delicious meals! Grain bowls, sometimes called “Buddha Bowls,” are all the rage these days — and for good reason. They are easy to prepare, they are infinitely customizable, and they’re generally inexpensive to make. Not surprisingly, a grain bowl starts with whole grains. Skip the Minute Rice and choose brown rice, barley, quinoa, farro, or even wheatberries. Next, load up your bowl with veggies. This is the perfect time to clean out your crisper and use up some odds and ends: a few bites of grilled zucchini from last weekend’s cookout, half a bell pepper, some shelled edamame. Now add some protein. The leftover approach works well here, too, so dig out the last of the rotisserie chicken, sauteed shrimp, or baked tofu. A poached or soft-boiled egg is perfect in a pinch. Top your grain bowl with your go-to dressing, or drizzle with pesto, harissa, hummus, tahini sauce, hoisin…the options are endless. Other additions that can elevate a bowl from blah to extraordinary include sliced avocado, fruit, nuts, pickled vegetables, nori, and fresh herbs. Grains not your style? No worries. You can assemble a delicious noodle bowl that incorporates all the fun healthy dinner ideas of a grain bowl. Steer clear of white pasta and choose nutty soba noodles, light, and refreshing rice noodles, or even “noodles” made from spiralized vegetables. Noodle bowls can be tossed with a vinaigrette or light sauce, or warm the whole thing in some chicken or vegetable broth for a cozy, slurpable soup that’s far better than anything you’d get out of a can. Millions of people around the world regularly make a meal of beans and rice in some form. Try red beans (with just a touch of sausage for flavor), black beans, pintos, black-eyed peas or pigeon peas, to name just a handful. Dry beans are generally a better choice because they’re much cheaper; canned varieties can also be high in sodium. Cook up a bag of beans in your pressure cooker or crockpot and freeze them in 1- or 2-cup quantities to make meal prep easy. Brown rice is the classic partner to any cooked bean, but one of the best healthy dinner ideas is to make a soupier preparation, like frijoles borrachos, and serve it with cornbread or corn muffins. Don’t be intimidated by stir fries. While they may seem complicated, there are many simple recipes that incorporate only a few ingredients. Try shrimp with broccoli or snap peas, for instance. You can also find plenty of stir fry shortcuts — bagged vegetable mixes, for example, eliminate much of the prep work that gives stir fry dishes a bad rap. While they may seem complicated, there are many simple recipes that incorporate only a few ingredients. Try shrimp with broccoli or snap peas, for instance. You can also find plenty of stir fry shortcuts — bagged vegetable mixes, for example, eliminate much of the prep work that gives stir fry dishes a bad rap. Another quick stir fry fix is to use a jarred sauce. While using a stir-fry sauce (or an Indian or Thai simmer sauce) is certainly convenient, and won’t require you to buy a lot of exotic ingredients that you might never use again (hello, tamarind paste and Szechuan pepper), read the ingredients list carefully. Some of these sauces can be high in sugar and sodium content. One way to achieve the ease of a prepared sauce while still keeping things healthy is to make your own in advance. Devote a few weekend hours to whipping up a batch of peanut sauce, teriyaki sauce, or green curry sauce. Most of these will freeze well, or refrigerate them in a tightly sealed mason jar for a week or two. Who doesn’t love to mix it up and make breakfast for dinner? For healthy dinner ideas, however, you’ll have to ditch the greasy sausage and the cinnamon rolls. Multigrain pancakes with fresh fruit are fun for kids and adults. Or whip up a quick batch of breakfast burritos using whole-wheat tortillas, low-fat cheese, scrambled eggs and whatever vegetables suit your fancy (we recommend sauteed poblano chiles, mushrooms, or spinach). Super short on time? Avocado toast to the rescue. It’s filling, provides healthy fats, and tastes great to boot. Use a whole-grain bread, and add extra veggies if you have them on hand. A poached egg perched on the smashed avo is one of the trendiest healthy dinner ideas around! Let’s face it — eating the same old salad can get boring. Worse, if you buy a head of lettuce and don’t eat it up quickly enough, it’ll go bad. That’s a big waste of money. The solution? Build a better salad with vegetables that can hang out in your fridge without being the worse for wear. Cabbage, whether white, red or a Chinese variety like Napa, makes coming up with healthy dinner ideas a snap. Shred it finely, add other veggies like bell peppers, carrots, and celery, and then toss with dressing. A cabbage-based salad stands up well to a heartier dressing, like peanut sauce. Cabbage, whether white, red or a Chinese variety like Napa, makes coming up with healthy dinner ideas a snap. Shred it finely, add other veggies like bell peppers, carrots, and celery, and then toss with dressing. A cabbage-based salad stands up well to a heartier dressing, like peanut sauce. Prewashed kale and other greens also tend to last longer than lettuce and pack a nutritional punch. Make a delicious kale or collard greens Caesar, and you may never return to romaine again! 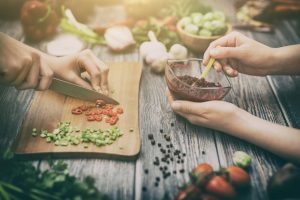 Finding healthy dinner ideas doesn’t have to mean scouring cookbooks for new recipes or spending tons of money on prepared foods from your local organic market. A little imagination and creativity, in addition to a fridge stocked with vegetables and a few healthy staples, will help you plan better meals, save money, and even lose weight.